The Moulin Rouge opened on October 5, 1889 in the Montmartre district of Paris. 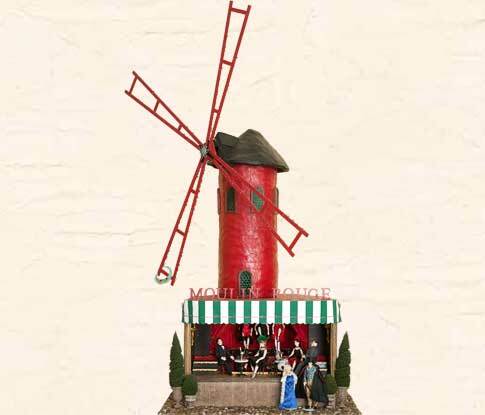 Moulin Rouge, which means “red windmill” was just that, a towering windmill painted red. As there are no known photographs of the original Suze's imagination filled in the blanks, and created her own vision complete with cancan dancers, absinthe drinkers and debauchery. The creation of the exterior Moulin Rouge began with a photograph from 1898, and grew from there. It is a modular building which comes apart in 5 pieces in order to be transpor-table. The sidewalk is made from actual pebbles, and the exteriors are made of paper clays that have been carved, stippled, and treated with up to six layers of paint. The windmill blades hold over 300 flashing lights, and there are fifty hand cut brass stars on the guide wires.